After turning the page on my office calendar to August, I paused to reflect on where the time had gone. Notes on the last few pages confirm each month was a whirlwind of activity, mostly of the non-fishing variety. Not that there wasn’t some time to fish, but much of my spring and early summer seasons were filled with other time-consuming activities; more on that later. Furthermore, favored places to fish were limited this year. Another hot, dry spring reduced flow on local rivers so much that productive fishing for smallmouth bass was affected and repairs at a local dam transformed some of my favorite spring fishing waters so completely I was forced to search for new ones. Nonetheless, the search for good fishing led to the discovery of new opportunities and limited choices encouraged me to invest more time in spring patterns still available. 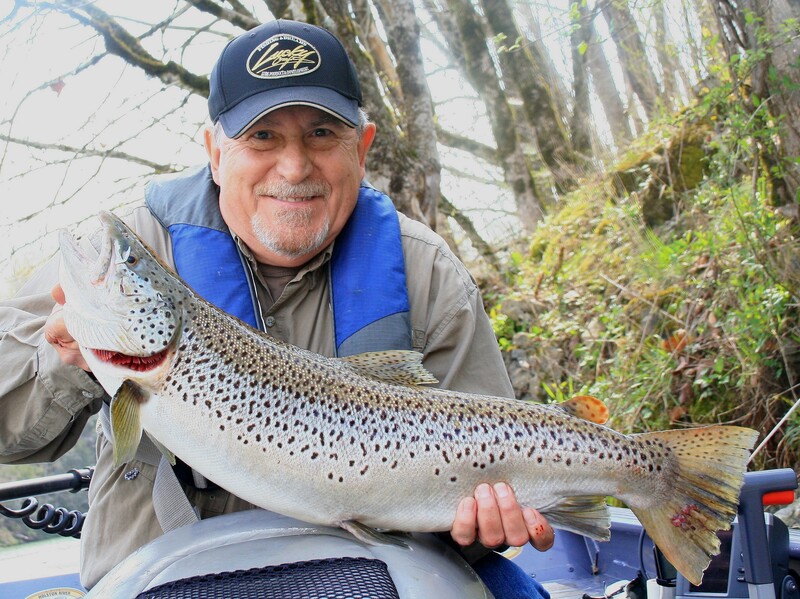 The extra time spent pursing two of my favorite game fish, rainbow and brown trout, produced an exceptional season of spring and early-summer trout fishing. I learned to fish for trout long ago, limited then to fishing small mountain streams and stock ponds for freshly stocked fish. Many years later after moving to Tennessee, my focus changed to catching holdover tail-water trout; those that had lived for years on a diet of abundant natural prey in cool, swift water. This spring has been a testament to what I’ve learned about fishing for larger tail-water trout. We caught many rainbows and browns above eighteen inches but some special fish and one exceptional encounter come to mind. My most memorable tail-water trout adventure so far in 2015 included my best fishing buddy Andy and his 12-year old son, Harrison. Harrison had already proved he could catch trout by trolling for them. On his best outing he was credited with catching twenty-eight rainbows, though Andy and I reeled in a few of them because we had several doubles hookups. However, this trip was Harrison’s first to cast for them so when we arrived on good water, casting practice began. Andy helped with the casting part but each time the lure hit the water, Harrison took control of the rod and the retrieve. Soon we were coaching him on ways he could vary his presentation by changing speed, pausing or adding subtle twitches. Not long into our second drift, Harrison’s rod bowed deeply and a big trout thrashed the surface. With a firm grip on his rod, he fought the big fish well while Andy coached and I controlled the boat in swift water. When Andy slipped the net under the struggling fish, shouts of victory filled the air. It wasn’t just a big trout; it was a huge brook trout. 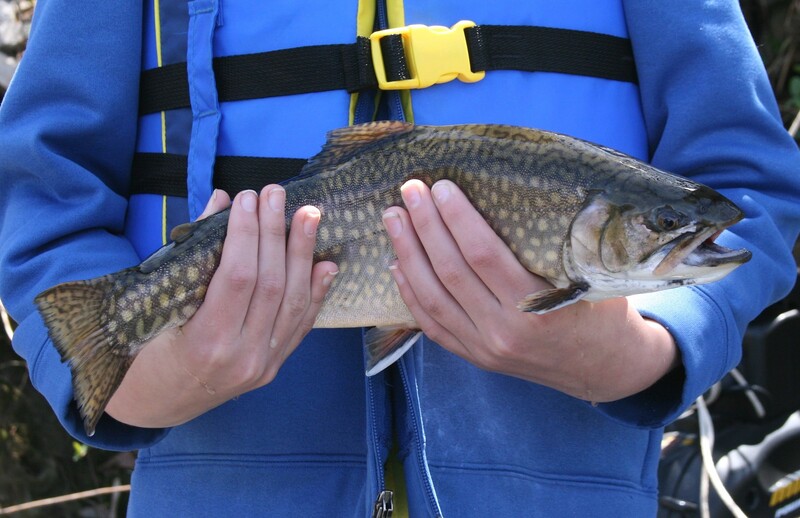 For those of you not familiar with brook trout, let me put the size of this fish in perspective. In the State of Tennessee, if you catch a brookie ten-inches or longer, the Tennessee Wildlife Resources Agency will award you with a colorful Trophy Fish Award, suitable for framing. The brook trout Harrison landed was sixteen-inches long. 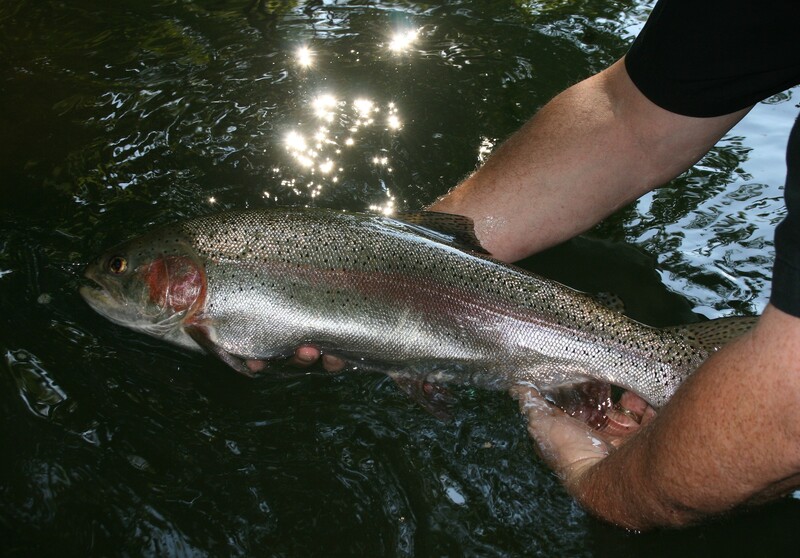 Before the day was over, he also landed a rainbow and brown trout above eighteen-inches. So on his first trip casting for them, Harrison landed the Eastern equivalent of the trout trifecta and did so with some remarkably nice fish. My most exciting fishing experience this season came on a day when time to fish was limited. With but a few hours free and no fishing partner, I loaded my boat and headed for the closest tail-water. Local weather and water generation schedules were favorable for trout fishing, though it was midday under a sunny, blue sky. After making the first drift through prime water without so much as a follow, I changed to a larger lure, returned to my starting point and began again. A few casts into the second drift a big fish smashed my plug hard and began stripping line. The fish moved so fast and with such power, I was sure it was a big hybrid and quickly realized my hands were full. I was adrift in fast water and approaching a shoal so shallow that hitting rocks with the trolling motor prop was a probability, but didn’t want to raise the motor and let the boat spin during the fight. With one hand on the trolling motor and the other controlling the surging fish, it became a very busy time. If I had a third hand, I’m sure it would have been equally busy. Suddenly, the fish charged the boat and did its best to tangle my line in the outboard. After a few tense seconds, it came free from the lower unit as the river bottom came up along the upstream face of the shoal. Then, out the corner of my eye I saw the big fish jump clear of the water. Even in my adrenalin-filled state I realized that hybrids don’t jump so my eyes strained for a clear view of my adversary as it approached the boat, then in less than two-feet of water. As we drifted over the shoal, the big fish swam closer and was soon swimming parallel to the boat in water so shallow it could clearly be seen. The light-brown color and big spots along the fish’s back confirmed it was a huge brown trout. After drifting into deeper water, it became a battle of patience and the big fish was in trouble. Finally, I led her into the net and lifted my largest brown trout ever into the boat; a beautifully marked twenty-nine-inch female. There was little time to set up and take pictures because my greatest concern was for the fish’s health. But after a few quick shots and gentle handling beside the boat, she recovered, surged from my grip and disappearing into the rushing water. I collapsed in my seat, took several deep breaths and talked to myself until my heart-rate slowed. Drained after the battle, I set out trolling rods and trolled back to the ramp. Several smaller fish up to sixteen inches came to the net on the relaxing cruise back that sunny afternoon. It was a brief though memorable outing and invigorating dose of outdoor therapy; one to remember for a very long time. Though my time on the water this season has been limited, a few trips for other fish were also rewarding. During early spring, a couple night-fishing trips for river-run walleyes produced good results. In spring, walleyes in most southern reservoirs migrate into primary feeder-rivers to spawn. This concentrates them in sections where water depth and flow are favorable and prey species are present. Find walleyes and what they’re willing to strike and it can produce good catches of one of the best-tasting fish in fresh water. My preferred method of catching spring river-run walleyes is trolling at night so I scheduled a couple evenings free to go after them. Our priority on the first night was finding places on the river that held fish and we soon caught enough for a meal of fresh fillets. In just a few hours on the follow-up trip, under a star-studded sky, we stayed busy catching and culling fish. Repeated trolling passes along a sixty-yard stretch of water produced more than two-dozen walleyes including a few double hookups with a smallmouth bass and catfish or two mixed in. Trolling at night on a river may sound like a recipe for trouble but it’s an effective method of fishing if you follow a few simple safety rules and employ the correct lures and methods of presentation. To learn more about trolling for walleyes and other fish at night on rivers, refer to the chapter on “Winter Fishing” in my book, The Weekend Angler’s Guide To Good Fishing. 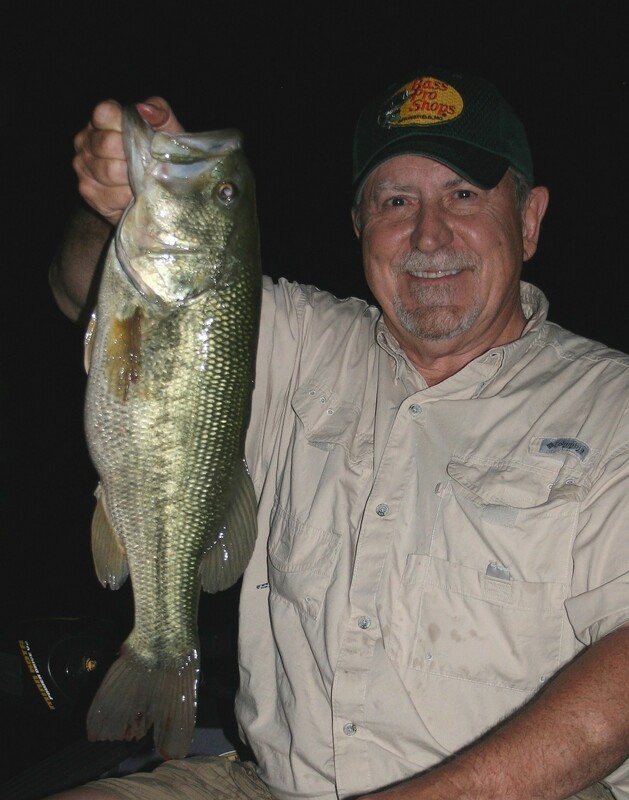 Several outings for bass produced nice catches, including both river and reservoir trips. We fished at night for reservoir largemouths when fishing pressure was lowest and smallmouths during the day on a river where only kayaks disturbed the serenity. Our first bass-fishing trip of the season to search for largemouths was interesting; a rough start that bloomed into a rewarding finish. We arrived late at the ramp and had to wait in line until almost dark before launching. Then, as we prepared to take off down lake I noticed some nasty looking clouds coming our way. By the time we reached a nearby bridge for shelter, it was raining steadily. An hour later we started down the lake, one we’d not seen before, to find a place to fish in total darkness. Radar on a phone app, a depth finder and some blind luck led us to a shallow point with a distinct offshore break-line that merged with a shoreline filled with alternating layers of rock, red-clay and gravel. I was confident the diverse mixture of bottom types would attract some fish. In the next few hours we landed sixteen bass along a hundred-yard stretch, mostly smallmouths, with a five-pound, five-ounce largemouth taking top honors. Small finesse jigs with plastic pork-chunk trailers caught all our fish though we tried several soft-plastics. Regrettably, I haven’t had time to go back and fish that spot again. A few half-day trips for river smallmouths produced good fish though larger bass were less than plentiful in the low, clear conditions. The realistic action of swimbaits and soft-plastic stickbaits caught the majority of our fish with Keitech Easy Shiners and Zoom Super Flukes catching the most. Various rigging methods worked well with the Flukes when matched to water flow and natural colors were consistently good choices. However, at times four-inch swimbaits caught more fish so we had to find the best lure and method of presentation on each trip. And I often mix in some variety when fishing so we did raise a few bass on other lures. One encounter that comes to mind didn’t end with a big smallmouth photo-op, but left a vivid memory. It was a day when water generation at an upstream dam was brisk. The water level was high and moving with scattered clumps of grass drifting on the surface. However, water clarity was good and the temperature was an inviting seventy-two degrees; ideal for active river smallmouth bass. In warm moving water, fast retrieves often work well when patterning river smallies so I grabbed a spinning combo rigged with a Pop-R and began quickly covering water. No more than a dozen casts later, a bruiser smallmouth crushed the lure. I set the hook and began reeling quickly, but then my line went slack. Before I could describe what had happened and add a closing expletive, my line suddenly started streaking up river. Panicked reeling soon pulled a bow in my rod and the battle was on. However, after a hard head-shake and short burst downstream the big fish spit the lure back toward me. I thought the bass had thrown the plug because of the poor hook-set but found it had violently removed the rear treble hook, split ring and all. It was a fast and memorable tail-whipping by a big, powerful river smallmouth bass. I hesitate to estimate the fish’s size but the boil it made on the strike must have weighed four-pounds. So my spring and early summer excursions, though limited, included some exciting and memorable fishing. Furthermore, a recent development that kept me off the water during much of the season produced many opportunities to meet other anglers and learn more about catching fish. 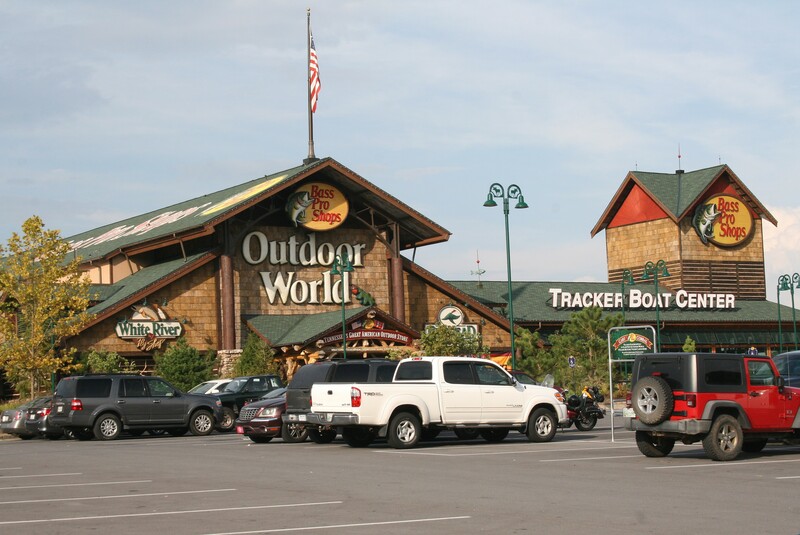 On April 1st, I accepted a Sales Associate position in the Fishing Department at the new Bass Pro Shop store at Exit 74 in Bristol, Tennessee. I’m working there part-time, including many weekends, and enjoying the interaction with other anglers immensely. So if your travels include a trip along the I-81 corridor through Southwest Virginia and Northeast Tennessee, take a few minutes to stop and ask for me there. I’d enjoy meeting you, swapping some fishing stories and helping you choose some lures and equipment for your next fishing adventure. Come by soon and let’s talk fishing! Hope to see you there.